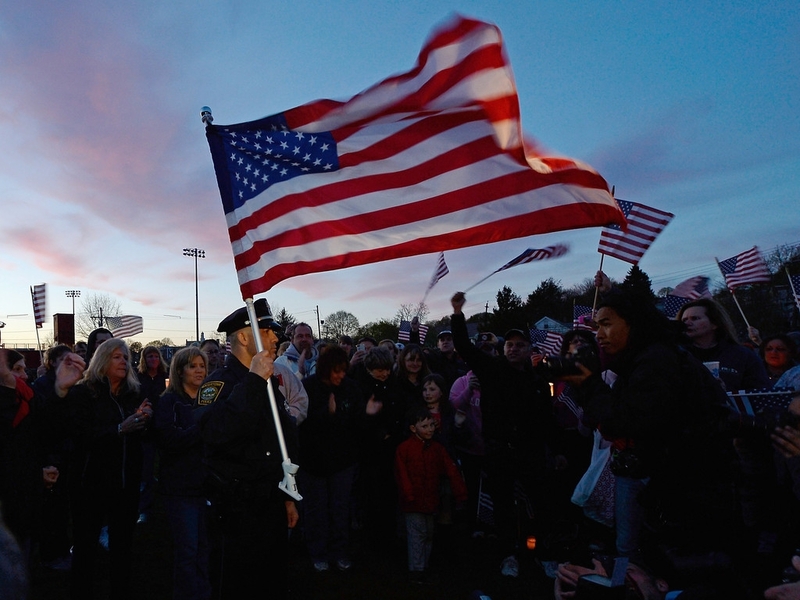 Watertown Police officer Brandon O'Neill holds a large U.S. flag during a candlelight vigil for victims of the Boston Marathon bombing at Victory Park on April 20, 2013 in Watertown, Massachusetts. A manhunt for Dzhokhar A. Tsarnaev, 19, a suspect in the Boston Marathon bombing ended after he was apprehended on a boat parked on a residential property in Watertown, Massachusetts. His brother Tamerlan Tsarnaev, 26, the other suspect, was shot and killed after a car chase and shootout with police. The bombing, on April 15 at the finish line of the marathon, killed three people and wounded at least 170. - high-definition photo for free download.